We sell trees, roses, shrubs, palms, pots, fruit trees and garden accessories. To keep costs as low as possible we produce most of the plants ourselves. We also sell a wide variety of six-packs. Shrubs are available from 1 liter to 10 liter and palms and trees from 1 liter to 200 liter. From time to time we have seedlings available on trays. Because we produce most of our plants on the premises it may be that we don’t have stock for short periods of time to ensure that all plants are at top standard before we sell them. Pietie and Susan Roux started the nursery in 1990 on the farm Nooitgedacht, Initially there was only one tunnel used for production of vegetable plants for the farmers of the district. The nursery was later expanded to include windbreak and plantation trees. Therefore the initial name Tulbagh Bosbou Nursery. As the years passed, our ranges of plants grew dramatically and now include roses, palms, indigenous trees and shrubs. 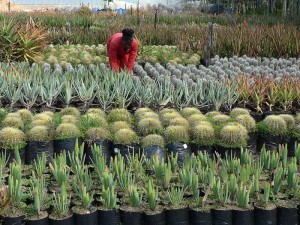 Since 2005 we have also included aloes and succulents to our production. Tulbagh Nursery is a family owned business with 20 hectares under plants. We supply work to a lot of people in the valley, especially during the winter months when there is a shortage of work. Our plants adapt very well to most regions in South Africa because they are exposed to our very hot summers, freezing winters and daily South-Easter.